I was deeply saddened to see the statement issued this morning in the name of Mr Sambandan following the leaking of some of the report of the UN panel. The statement seems to hark back to the confrontational approach the TNA had repeatedly adopted when opportunities for reconciliation were available. I was reminded then of my efforts, as Head of the Peace Secretariat, to meet Mr Sambandan, as discussed with His Excellency the President, shortly after the defeat of the LTTE. Mr Sambandan, while never refusing outright, kept saying he was too busy, because he had to meet with several foreign dignitaries. Clearly, he felt that peace was better achieved by requesting foreign pressure rather than by discussions with mandated Sri Lankans. Subsequently, the TNA decided to support the candidature of Sarath Fonseka for the Presidency. Given the pronouncements of General Fonseka both before and after the victory over the LTTE, and his efforts to slow down resettlement of the displaced, I cannot believe that Mr Sambandan and his colleagues seriously felt that Mr Fonseka’s candidacy was the best option for the Tamil people. At the time I expressed my suspicions of a meeting I saw take place at the home of the Political Affairs Officer of the American Embassy, Paul Carter. While enjoying his hospitality and listening to accounts of interactions between his Office and the JVP, I saw Mr Sambandan come in, and thought I should pay my respects before I left. I found him in the garden with the European Union Representative and the American Ambassador, and they looked so bemused that I realized I was probably interrupting something confidential. I offered to leave, but Mr Savage recovered himself and was reasonably polite. The other two stayed silent, so I soon took myself off. I began to think then that I was going to be persona non grata with the Americans, which was a pity considering the regard I had had for Bob Blake, but indeed subsequently the new Ambassador has also proved charming. 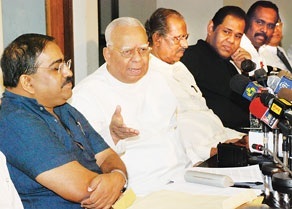 But I felt then that the TNA was being encouraged to succumb to Sarath Fonseka’s charms, and I was not surprised thereafter when he received a string of endorsements from both the TNA and people like Jehan Perera, who did not deny it when I asked if that was what his paymasters wanted. And I felt that my view was endorsed also by several European envoys, who subsequently expressed surprise at the games that had been played with Fonseka, including Bernard Savage’s strange defence of military men in politics. Be that as it may, I had the impression subsequently that most persons settled down to reality, after the elections proved conclusively that Colombo elite perceptions were absurd. So I was optimistic about recent talks with the TNA, as well as what seemed efforts by certainly the Americans to promote reconciliation. However the report of the Panel has again allowed old emotions to flourish, and it seems that the TNA is once again going to embark on a policy of confrontation, expecting foreign friends to pull their chestnuts out of the fire. Over a year ago I pointed out to the British, at a meeting in their Foreign Office, the damage they could cause to Tamils by continuing to support the leftover rump of the LTTE, and by urging discussions with elements like the Transnational Government. My point was that the government wanted to work positively with the Tamils, but it could not trust the LTTE or its by-blows, and that continuing support for these would only serve to polarize. Unfortunately I begin to suspect that polarization is part of the agenda of some of those who wish to interfere in Sri Lanka, though I had hoped that at least current envoys in Sri Lanka were wiser. My advice to the British was to follow the example of the Indians, who had never swerved from support for the Tamil people, while consistently evincing strong hostility to the LTTE. My argument was that that was the position of the decision makers in government, and foreign friends should affirm and support this position without trying to satisfy their own electorates. to swifter resettlement and rehabilitation than in any comparable situation. But people believe what they want to believe. In the process they contribute to hostilities which pave the way for extremist reactions, and sanctimonious self-justification based on similar behavior by their opponents. And meanwhile those who do not want reconciliation are cynically laughing.